First, some context. If you're a longtime reader, you might not recognize the vast majority of the items, despite how faithfully I've been documenting my fashion purchases since January of 2015. The vast majority of what I sent in predated the start of my monthly budget posts, with only three of the items they accepted having been purchased since (a Loft sweater from last year, a pair of H&M shorts from 2015, and a J.Crew lace bridesmaid dress that was an off-budget purchase last year). Most of the items were, therefore, quite old. That I still had so much to send in from that long ago probably speaks to how difficult it can be to do a serious closet clean-out (and the sheer quantity of items I was buying before I started embracing minimalism and being more careful about shopping). I'd done several rounds of closet cleaning-out before I started this blog, did a bigger round of KonMari-style closet decluttering in early 2015 before sending a bunch of things to the now-defunct Twice and ThredUp, and have done several smaller rounds since. One round of KonMari method was enough for everything else I owned, but not for my closet. They now charge a $6.99 shipping and handling fee per bag. They'll deduct this from your payout, rather than charging it upfront, and will waive the fee if they don't accept enough items to cover it. Processing time takes longer now, approximately seven weeks. They received my bag on June 29th, and only got back to me about my payout last week. Total time between the date I shipped it out to the date I'll actually receive my payout (via Paypal), instead of as store credit, is about ten weeks. They're more likely to put items on consignment now. That may not be a good thing for sellers of J.Crew or Ann Taylor-type items as a general rule, as the payout for consignment items is, of course, not guaranteed, and the per item payout isn't even much higher than the upfront payouts. Their policy on which items get upfront payouts and which will be put on consignment is not terribly concrete, with items that are "on-trend, in-season, in great condition, and likely to sell quickly" getting upfront payments and items that are "in great condition that may take longer to sell because of the unique nature of the items" going on consignment. Whatever process they use to determine what items go in which box, it seems generally accurate, as most of my "upfront payout" items throughout the years sold quickly. Selection process and pricing continue to seem a bit arbitrary. While I was generally very happy with my payout, given that many of my items were well-loved and on the older side, as with my previous experiences, I was somewhat surprised by some of what they took and what they rejected. I sent in a rarely worn J.Crew silk blouse (this style, different color), for instance, which they didn't accept, as well as some worn-once Ann Taylor pencil skirts. Those items were, likely, generally in nicer shape or otherwise nicer than many of the things they have accepted from me over the years. 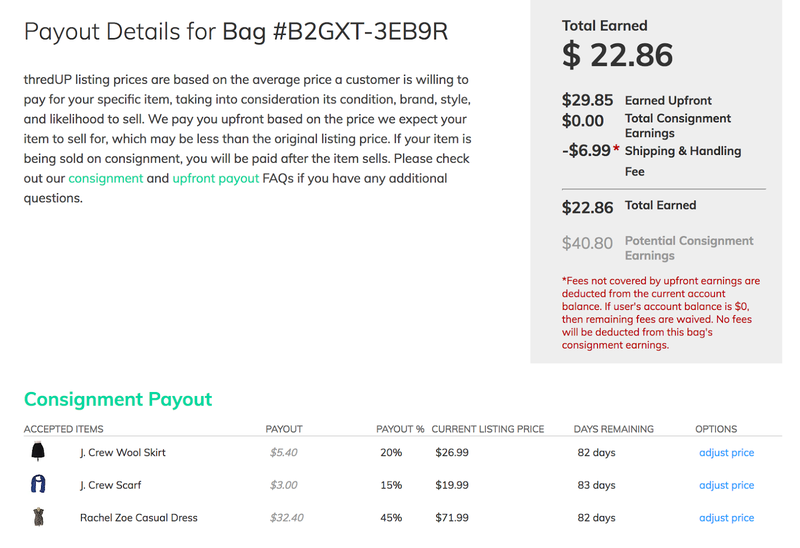 Selling to ThredUp does, naturally, result in significantly lower returns than more high-effort ways of selling, such as Poshmark or Ebay. I definitely wouldn't send ThredUp anything particularly high value, as they can be quite stingy or arbitrary in their acceptance of individual items here and there. For my needs and work schedule, however, and given the fact that I generally don't have particularly "special" items to sell, just fairly generic items from the general price range between H&M and J.Crew, I've been very satisfied.